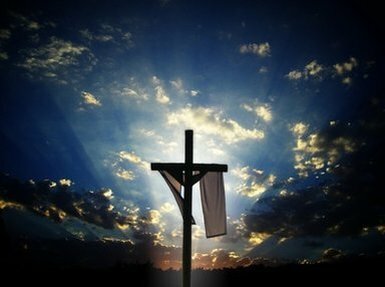 We wish all families a blessed Easter! ​We have an all-school Mass on Tuesday, 23 April to celebrate Easter. Mass will take place in the MultiPlex at about 12:40 pm. Parents are welcome. Schedule 5 is in effect. We will have a Relaxed Dress Code on Friday, 26 April, in support of the Washington, DC trip. A contribution of $2 is required to participate. Progress Reports were mailed on Friday, 12 April. Please contact Catherine Smither if a mailing is not received by Wednesday, 17 April. Students will be dismissed at 2:25 pm to accommodate a staff meeting. Schedule 2 is in effect. ​All students will participate in a reconciliation service on the morning of Wednesday, 17 April. The Sacrament of Reconciliation will be available to students during the afternoon. Schedule 3 is in effect. Students are encouraged to participate in a Relaxed Dress Code day in support of Crusader Soccer. A contribution of $2 is required to participate. ​No school due to Easter Monday. 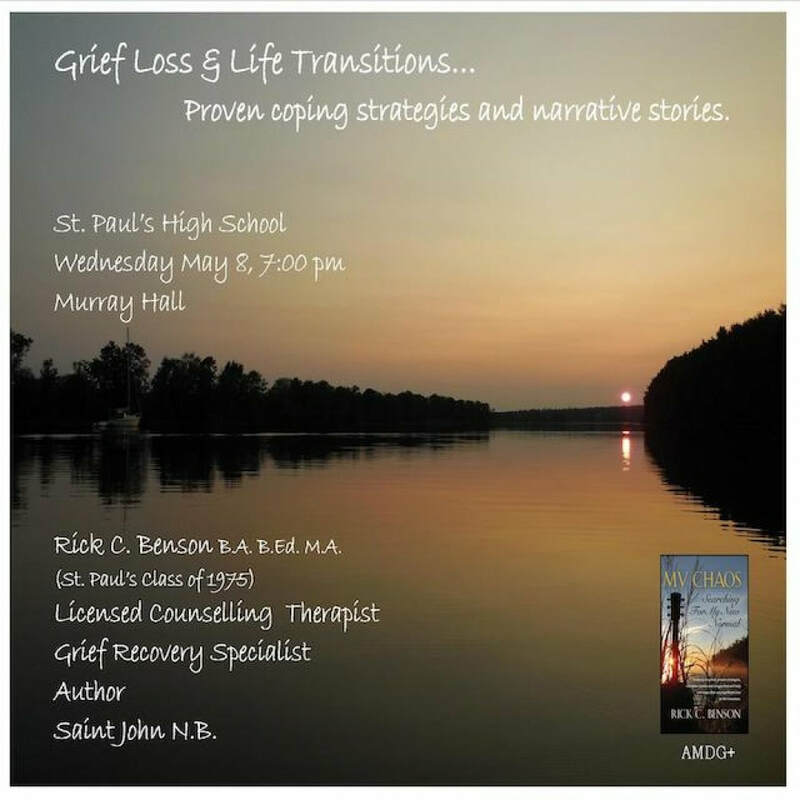 St. Paul's alumnus and author, Rick Benson '75, is offering an evening interactive workshop to parents, alumni and staff on how we can practice healthy coping mechanisms and support others we care for. "We are not meant to deal with Loss, grief and life transitions alone. Your experiences are unique - no exceptions. Not only death but changing health, relationships, and meaning in life, can have profound effects on the person and their loved ones. One size or program does not fit all. This workshop will present a collection of evidence based interventions and narratives that provide significant results in reducing stress and anxiety. The uniqueness of this program is that it is interventions and stories infused of the spiritual dimension of loss." If you are interested in attending this event, please click the registration button below. Note: you will be required to log in to the St. Paul's Online Community to complete the registration. There are no classes on this day to accommodate a professional development day for the St. Paul's faculty. Progress Reports will be mailed on or before Friday, 12 April. Please contact Catherine Smither if a mailing is not received by Wednesday, 17 April. Students are encouraged to participate in a Relaxed Dress Code day in support of the St. Paul's Wrestling Program. A contribution of $2 is required to participate. The Guild hopes that everyone had a lovely Spring Break! We would like you to be aware that this month’s meeting, scheduled for April 10, has been cancelled. The next Parent Guild Meeting will be held at 7:00pm on Wednesday, May 10 in the Aulneau Room. All parents are invited and welcome to attend. 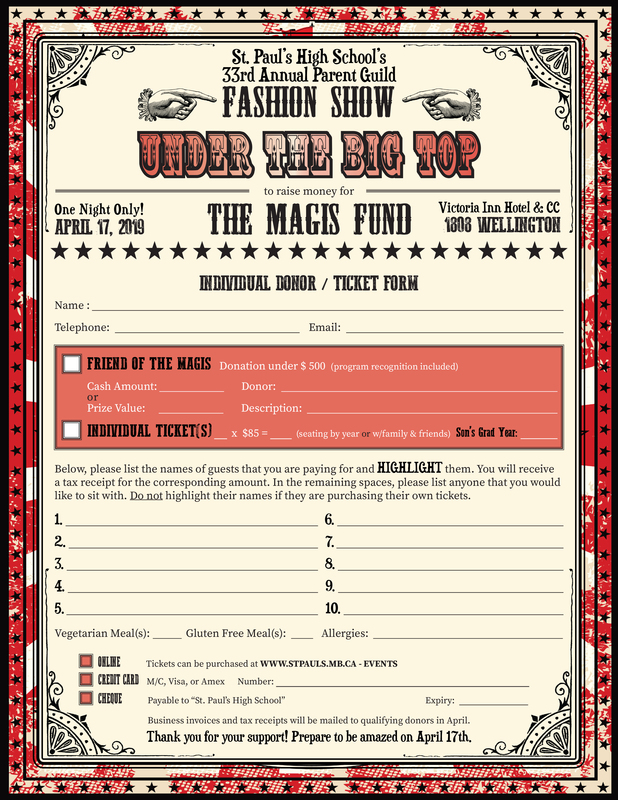 The main reason we have decided to forgo our April meeting is because we are very, very busy “Under the Big Top” creating an AMAZING event for our parents, students, relatives, alumni, and friends. 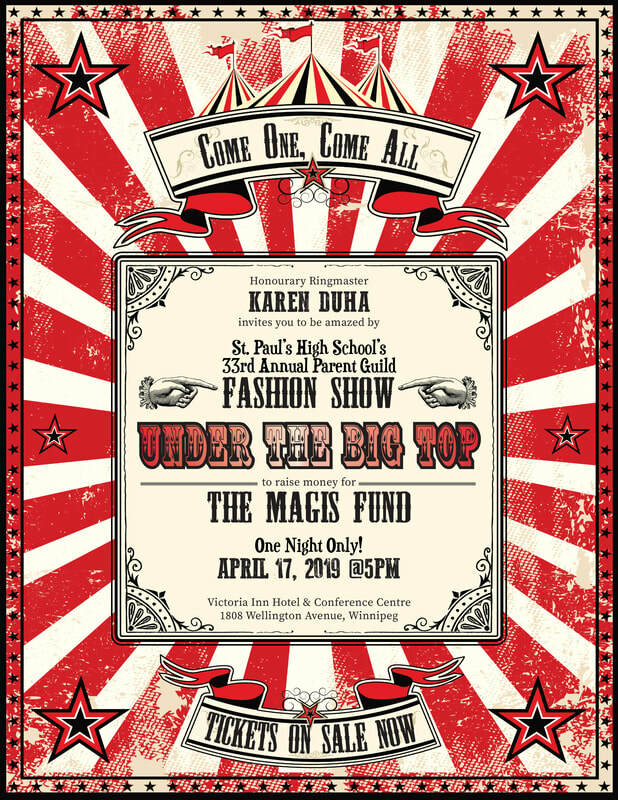 Don’t forget about the 33rd Annual SPHS Parent Guild Fashion Show & Fundraiser, presented by the Duha Group, taking place at 5:00pm on Wednesday, April 17. Honourary Ringmaster Karen Duha invites one and all to what is sure to be the GREATEST EVENING EVER, featuring a cocktail reception, sideshows, fancy circus eats, an opening act, professional fashion show, and a chance to win incredible prizes - including a $4000 “Adventure of a Lifetime” and $500 worth of luggage! Don't miss this fantastic opportunity to immerse yourself in the St. Paul's community and to change a life. 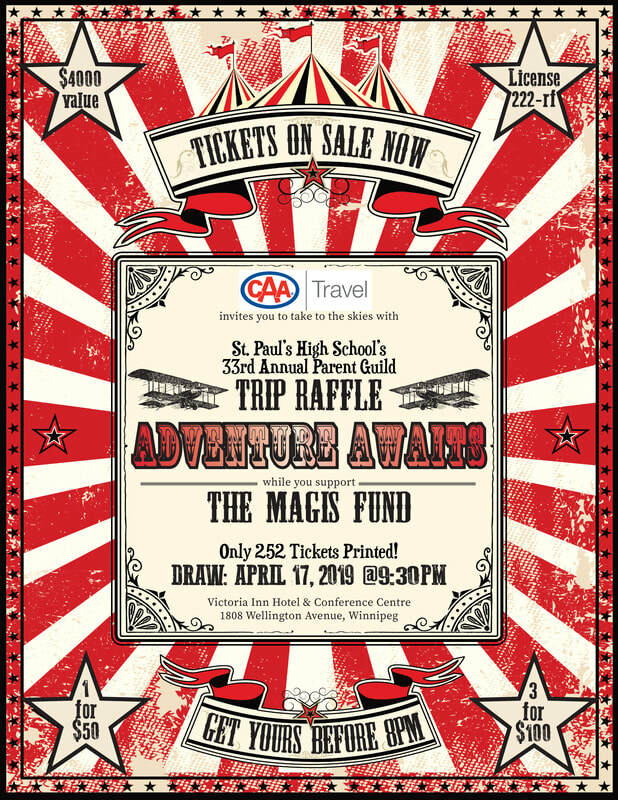 A few tickets and sponsorship opportunities are still available by calling the school or visiting the SPHS website, but please be aware that the deadline is Wednesday, April 10. Danali has been a supporter of our show since 1986. On Saturday, April 13, its owners have extended an invitation to the St. Paul’s Community to its Tiger of Sweden Spring Collection Launch Party. Tiger of Sweden is Danali’s biggest suiting brand and might be a great investment for graduation. There will be a DJ, giveaways, food, and refreshments. Sounds like a roaring good time! Looking forward to clowning around with you in two weeks! Congratulations to all players and coaches on both the Maroon and White Grade 9 Basketball Teams. Both teams were successful in earning a spot in the championship game played at Ten Voc High School on Thursday, 21 March. The game was extremely exciting and well-played on both sides. In the end, the White team edged out the Maroon team with a final score of 69–60. The boys all played hard and made the school very proud! ​Crusader Wrestling Program Wins Provincial Title! 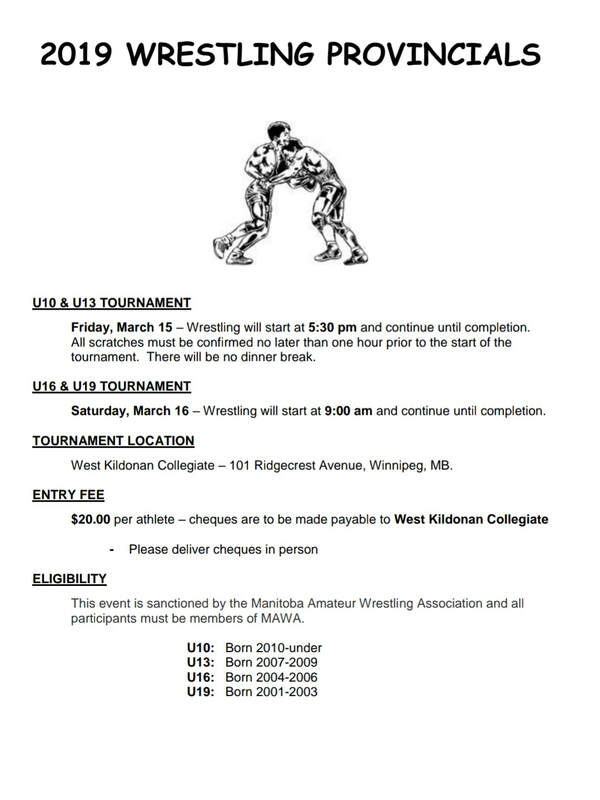 The Crusader Wrestling team participated in the 2019 Provincial Wrestling Championships on Saturday, 16 March. Thirty-one wrestlers took to the mats to represent our school in their most important meet of the season. Our boys battled against all comers in one of the toughest high school sports we offer, to earn some treasured hardware (14 in all) AND the provincial team title…our school’s fourth straight championship! Congratulations to Provincial Champions Ivan Rakowski '21, Cole Doyle '21, Hayden Piché ’21, Sam Pereira ’21, Sharif McCurdy ’22 and Joecel Cleodoro ’22. Capturing silver medals were Navmeet Makkar ’21, Jackson Fortat ’22, John Moncrieff '19 and Eric Fontaine ’22. Bronze medals were awarded to Riley Wilcosh ’22, Skyler Griffith ’21, Harry Engel ’22 and Tyler Sierhuis ’22. A special congratulation goes out to Jackson Fortat ’22 and Riley Wilcosh ’22 for competing up an age group in the U19 division and even securing for themselves a medal! We were all very proud of their performances and especially the brotherhood they exemplified in cheering on each other during every match. It was truly moving. Although many tears were shed knowing that for our Grade 12 members, it would be their last tournament as a St. Paul’s student, their commitment and contribution to our wrestling program will surely never be forgotten. All this being said, this year was a unique one. The previous head wrestling coach Mike Watson had built an exceptional program at St. Paul’s, and with his expertise, enthusiasm and dedication, he attracted many of our students and trained them to become the wrestlers they are today. There was thus an understandable concern that with his departure the wrestling program might fall apart. But thanks to the commitment of the returning wrestlers and especially our Senior members, the program flourished and even brought in some exceptional new members. Many of our Grade 12’s and 11’s took on leadership roles inspiring the younger members and welcoming them onto the team. Alumni and volunteers also came in to help instruct and keep the program running smoothly. A special thanks goes out to Leah Ferguson, an Olympian-level Wrestler who volunteered her time to head coach our program, offering her expertise, wisdom and enthusiasm. Samson Abbott – an Alumni of St. Paul’s attended every practice and helped out with our heavy weights. Charlie Peronto, another one of our volunteers, offered his collegiate level experience cornering our wrestlers at every tournament. Many thanks go out to Mr. Fiebelkorn '09 and Mr. Stacey who also helped coach and manage the program. They clocked in the hours working behind the scenes making sure our wrestlers got safely to the various tournaments and even ran and hosted our own at St. Paul’s. The Crusader wrestling program would also like to thank Mr. Schroeder and Mr. Derek Brogan for their athletic therapy, strength and conditioning, and overall support of our wrestling program. The wrestlers truly enjoyed having you as a part of their experience. With the care we receive, we are the envy of all other wrestling programs in the province. A shout out of thanks to Mr. Higham and his lovely wife, Mr. Lewin and Fr. Boutilier for travelling out to the West Kildonan High School host location to cheer on our guys. Your presence was very much appreciated. Last weekend, St. Paul's entered two teams in the Manitoba Robot Games. In the Mini Sumo (tethered) Tournament, Peter Daza '22 (along with teammates, Donovan Martin '22 and Alex Sala '22, who were unable to attend the tournament) finished 4th out of 40 robots and the team consisting of Nicolas Woods '22 Woods and Tyler Sierhuis '22 (along with teammate, Alex Porter '22, who was unable to attend the tournament) finished in the Top 15. This was the first year St. Paul's students made it to the playoff portion of the tournament. Congratulations to these teams for a good showing and many thanks to our dedicated staff, consisting of Ms Sherri Nichols, Mr. Justin Daman '10, and Mr. Euan Burton, for running the Robotics Club at St. Paul's! Tommy Feldman '20 was recognized as the most promising newcomer to drama with the Fr. Murray Award. Congratulations to all individual award winners and the entire Dramatic Society for a job well done! During our third Mission Week last May, our school community raised over $10,800 for cataract surgeries. A team of eye specialists from Texas goes to Africa each year to complete cataract surgeries in various regions. Because of the generosity of members of our school community, we were able to fund fifty-four cataract surgeries. The following video, created by Sight.org, shows their appreciation for our support and some of the recipients of the surgeries. Thank-you one and all! St. Pauls Gives Sight from Sight.org on Vimeo. There are no classes Monday, 25 through Friday, 29 March due to Spring Break. Regular classes resume on Monday, 1 April. School Day: 4. Late Start: Period 1 begins at 9:20am to accommodate a staff meeting. Schedule 3 is in effect. Relaxed Dress Code: Participate in a relaxed dress code for $2.00 in support of Crusader Golf. Next Weekly News Update: ​will published on Friday, 5 April. ​We wish all students and families a safe, restful, and enjoyable Spring Break! Cru Puck A Captures 4th consecutive AAAA Provincial Title! Congratulations to all of the payers and coaches on the Crusader A Hockey Team for a great season and on winning a record-setting 4th consecutive AAAA Provincial Championship. The Crusaders defeated the Sturgeon Heights Huskies 3-0 in a fast-paced and hard-fought game on Monday, 11 March at the BellMts Iceplex. Thank you to all our fans for coming out to support the Cru! Thank you to all families and students who participated in the shoe drive organized by the Human Rights Initiative at St. Paul's. You contributed 87 pairs of shoes and more than $500 to provide footwear and footcare to those struggling to cope with financial, social, mobility, or mental-health issues in Winnipeg. A special thanks goes out to Rohan Sethi '21 for leading this initiative and who delivered the shoes, along with teachers Mrs. Anna McGill and Ms Christine Janzen, to a local drop-in centre on Saturday, 9 March. We will have a liturgy to follow-up on the Freshman Retreat which took place last December. All students are welcome, however, all Grade 9 students and retreat leaders are expected to attend. We will follow Schedule 3 and the liturgy will take place in the MultiPlex with a start time of about 8:40 am. Parents are welcome to attend. The warning bell for the start of classes will sound at 9:15 am. Reservation and Enrolment (R&E) Agreements were mailed on Monday, 11 March. Please contact Ms Catherine Smither if you have not received a re-registration package by now. The return deadline is Wednesday, 20 March at 9:00 am. ​Students are encouraged to participate in the relaxed dress code for $2.00. Proceeds will support the Rugby Program at St. Paul's. ​COME ONE, COME ALL!! 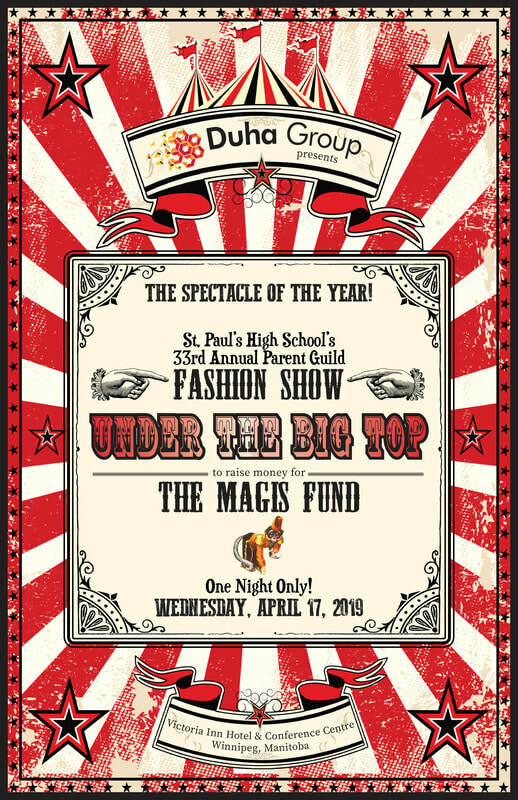 St. Paul’s High School parents, students, relatives, alumni, and friends are invited to be amazed by the 33rd Annual SPHS Parent Guild Fashion Show & Fundraiser, “UNDER THE BIG TOP,” presented by the Duha Group. It’s going to be the greatest ever, featuring a cocktail reception, delicious dinner, professional fashion show, a chance to win incredible prizes, and a few jaw-dropping surprises. Don't miss this fantastic opportunity to immerse yourself in the St. Paul's community and to change a life. Tickets and sponsorship opportunities are available now. Get them before they are gone! The deadline for completing online elective course selection is Monday, 11 March. Use the following links to access the appropriate online form. Grade 11 students will attend the morning session of the 18th Annual Holocaust Symposium at the University of Winnipeg, Duckworth Centre. Students are expected to get to the U of W on their own by 9:15 am and check in with their teacher. Limited bus transportation is available back to St. Paul's, however, students are required to sign up for bus transportation on the permission form for the event. Permission forms are due to Grade 11 Religion teachers on Monday, 11 March. Grade Bake Sales – Throughout the year, Coordinator Julie Paterson has been asking parents to provide cookies, squares, and bars to sell during designated lunch hours. Judging from the sales and the smiling faces, these special days have been big hits. Thank you so much to all the families that support this important fundraiser by baking, helping to sell, and/or purchasing goodies. SPHS Annual Open House – Coordinator Linda Hutter did a bang-up job of feeding and hydrating 500+ attendees. She and her volunteers were busy until 9:30pm, when the last guests exited the Multiplex. Your hard work does not go unrecognized! 4th Annual SPHS Parent Retreat - The Guild’s Ignatian Mission & Vision Committee, headed by Sheila Stark-Perreault is to be commended for putting on a wonderful event. The evening was inspirational, and the food was delicious. Kudos to all involved! Entrance Exam Baking – Thanks to Hospitality Chair Tara Alexander and several volunteer bakers, prospective students were able to enjoy some sweet treats, and hopefully ease some anxiety, as they wrote entrance tests. The Guild endeavours to make them feel at home and strive to be more than a Crusader for a Day. Parent-Teacher Conferences – Thanks to Fiona O’Hara and her team, the Parent Guild provided refreshments to families attending interviews at the school. Nearly New Rack – During Parent-Teacher Conferences, Co-Coordinators Marnie Kaul and Sigrid Duncan sold gently-used Dress Code clothing. Our gratitude goes out to them and to all families whose donations and purchases support SPHS’s Christmas Hamper Program, the Magis Fund, and Gonzaga Middle School. Fr Crouch SJ Pancake Breakfast – Approximately 1800 pancakes and sausages were cooked and served to students and staff on Shrove Tuesday. A huge shout-out to the Angela de Garcia for organizing this tremendous undertaking and to all the parents who woke up early to help out. We hope you were able to have a nap later in the day! Angus Reid Debate Tournament – Co-Coordinators Cheryl Juras and Rhonda Chorney were on hand to serve a light snack and refreshments to participants and spectators during this evening event. Thanks, ladies! Please note that our next Parent Guild Meeting will be held at 7:00pm on Wednesday, March 13 in the Aulneau Room. All parents are invited and welcome to attend. Lastly, we would like to remind parents, students, relatives, alumni, and friends about the 33rd Annual SPHS Parent Guild Fashion Show & Fundraiser, presented by the Duha Group. Come one, come all to the Victoria Inn & Conference Centre at 5:00pm on Wednesday, April 17. Honourary Chair Karen Duha invites you to be amazed “UNDER THE BIG TOP”! It promises to be the greatest event ever, featuring a cocktail reception, delicious dinner, professional fashion show, a chance to win incredible prizes, and a few jaw-dropping surprises. Don't miss this fantastic opportunity to immerse yourself in the St. Paul's community and to change a life. Tickets and sponsorship opportunities are available now on the school’s website. We will follow a modified schedule and students will have pancakes between 8:30–10:30 am as we head into Lent. We will follow Schedule 5 to accommodate our Ash Wednesday Service. The service will begin at 12:40 pm in the MultiPlex. Parents are welcome. ​Relaxed Dress Code in support of the Cerebral Palsy Bike Race. $2 to participate. Click the following button to view information related to graduation portraits for members of the Class of 2019. ​Reservation and Enrolment (R&E) Agreements will be in the mail on or before Monday, 11 March. The return deadline will be Wednesday, 20 March at 9:00 am. 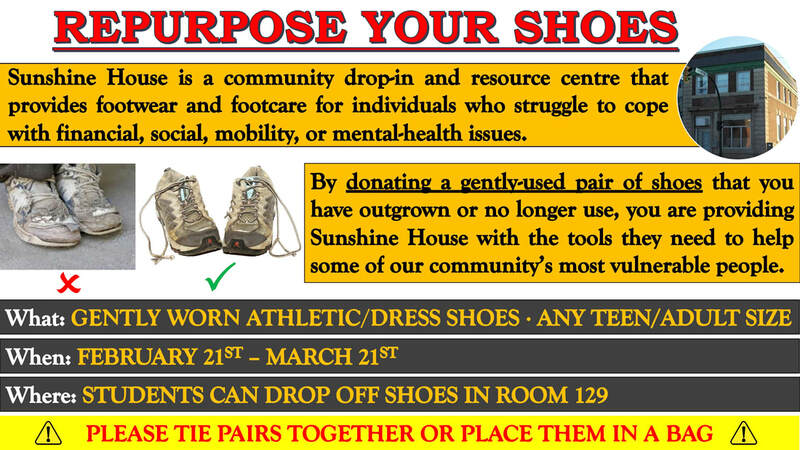 Last Thursday, the Human Rights Initiative supported a shoe collection campaign organized for a community drop-in and resource centre in the city's inner core called Sunshine House. Thanks to the generous support of staff and students, plenty of shoes were collected and over $500 was raised for the organization's footcare/footwear program. Sunshine House is a community drop-in and resource centre located in the city's inner core that provides, among other services, footwear and footcare to those struggling to cope with financial, social, mobility, or mental-health issues. These can include homeless and transient individuals, as well as immigrant families. By donating a gently-used pair of shoes that have been outgrown or are no longer of use, Sunshine House is provided with the tools they need to help some of our community's most vulnerable individuals. Shoes of any style, any teen or adult size, and of any gender are welcome, although there is a greater need for athletic and dress shoes. Students can drop off shoes in Room 129 until March 21. For all shoe donations, please tie pairs together or place them in a bag for sorting purposes. Thank you in advance for your support! Prizes will be awarded to best theme-dressed patrons. Vegetarian and gluten free meals are available upon advance request. 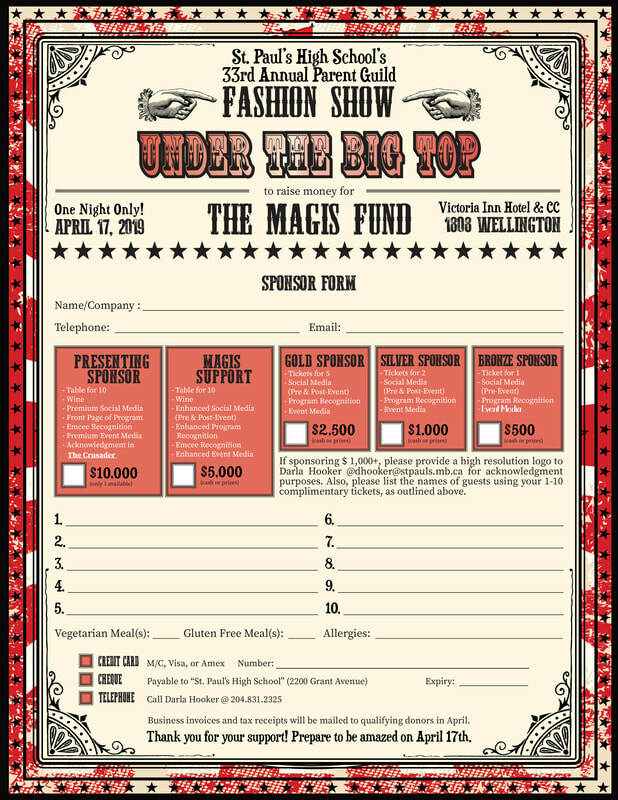 Come enjoy an exciting evening featuring a professional fashion show, cocktail reception, delicious dinner, and a chance to win incredible prizes at 33rd annual St. Paul's High School Fashion Show, in support of the Magis Fund. The Fashion Show will feature the Class of 2019 students hitting the runway, accompanied by professionals from Panache Modeling Agency. In addition to viewing apparel from Winnipeg’s finest clothing stores, you will be treated to some fun surprises. Our auctions are truly remarkable, thanks to the support of local businesses and families. Moreover, every bid on the Rainbow, Silent and Live Auctions goes directly to helping a student in need. Don't miss this fantastic opportunity to immerse yourself in the St. Paul's community and to change a life. Mark your calendar. Call your friends, relatives, and fellow alumni. Buy your tickets now. ​All in our school community are invited to participate in Pink Shirt Day. This anti-bullying campaign began several years ago in Nova Scotia after a group of students rallied around a Grade 9 boy who was being bullied for wearing a pink shirt. Students showed their support by distributing pink shirts throughout the school. Their kindness caught on and now schools throughout North America wear pink shirts twice a year in order to show their resistance to bullying in schools, workplaces and online. On Tuesday, 26 February, the St. Paul’s Senior Debate Team hosts the 19th Annual Angus Reid Debating tournament. The tournament is cross-examination style, and is open to spectators who wish to support our boys. Additionally, we always require judges. No experience is required at all, as debate is meant to appeal to listeners with no specialized knowledge. If you are interested, or know of anyone that is, please contact Tyler Kelsch. Parents of Grade 11 students are asked to bring baked goods to the Reception Desk on the Tuesday morning. Thank-you in advance for contributing baked goods. ​The annual St. Paul’s Winter Sports Day will take place on Wednesday, 27 February. The Student Council has been hard at work planning an all-day event for students. The day will begin with attendance at 9:00 am in designated attendance rooms (warning bell at 8:55 am). The list for the Attendance Stations will be posted in the Student Link on Monday, February 25. After attendance is taken, students will be bussed to their chosen morning activity and return to the school for lunch at 12:00 pm. Attendance will be taken again at 1:00 pm and students will then proceed to the Multiplex for the Crusader Olympics activity. Dismissal will take place between 2:30 and 2:40 pm. If your son has not yet registered for an activity, but would still like to, please do so on or before Sunday, February 24. The online registration link will close at midnight on February 24. If your son is not registered for a morning activity he will be placed in an all day Study Hall on February 27. Attendance is compulsory and a medical note may be required in order to excuse student absence. The relaxed dress code day is in support of Crusader Badminton. $2.00 to participate. ​Parking: Student Lot of Bower Blvd. The order of class periods will be modified as follows: ​5, 2, MGM, 3, Lunch, 4, 1, 6 (periods 1 and 5 are switched) to accommodate a presentation on vocations to grade twelve students. Father Edmund Lo, SJ, Director of Vocations for the Canadian Jesuits, will be visiting St. Paul's. Fr. Lo will speak to all Grade 12 students during the first period slot and then visit select Grade 12 classes during the second and third periods for an opportunity for the students to ask questions. St. Paul's High School is closed due to Louis Riel Day. We will follow Schedule 5 for our First Term Awards Assembly. Students on Silver and Gold Honour Roll will be announced followed by awards from teams who completed their seasons during the Fall or Winter. The Assembly will take place in the MultiPlex and will start at about 12:40 pm. Parents are welcome. Please be reminded that Thursday, 21 February is the annual Open House at the University of Manitoba. All grade 11 students will attend this event to learn more about programs and opportunities at the University of Manitoba. Students will make their own way out to the University of Manitoba and meet before 9:15 a.m. at St. Paul’s College’s Jensen Theatre. The day will end at 2:30 pm.​ Permission slips and schedules for the day have been sent to all grade eleven students on the Community. Outstanding permission slips can be submitted on Tuesday, 19 February. No school due to parent-teacher conferences. Online appointment booking takes place through the Powerschool Portal until Wednesday, 20 February at 3:30 pm. If a teacher is fully booked and unavailable, please contact the teacher directly to arrange a meeting outside of the regular parent-teacher meeting times. Term 1 Report Cards were mailed on Thursday, 7 February. Please contact Catherine Smither if you do not receive a report card in the mail by Tuesday, 12 February. Online appointment booking takes place through the Powerschool Portal commencing Monday, 11 February at 8:30 am and will continue until Wednesday, 20 February at 3:30 pm. If a teacher is fully booked and unavailable, please contact the teacher directly to arrange a meeting outside of the regular parent-teacher meeting times. Allow at least 5 minutes between appointments to allow time to move between meeting locations. Refer to the following teacher/room listing and school map before booking appointments to reduce walking-time between appointments. ​The standard appointment length is 5 minutes. In cases where a longer meeting is required, parents are invited to book two-5 minute appointments with the same teacher in consecutive time slots. Monday, 11 February is the deadline for transfers to Essential Math. Students should speak with their Counsellors to discuss this option, if applicable. Students in Grade 11 or 12 taking an extra credit elective course have until Monday, 11 February to drop extra credit courses. Students should speak with their Counsellors to discuss this option, if applicable. Relaxed Dress Code for $2.00 in support of Crusader Hockey. There is no school on Friday, 15 February as our faculty will be participating in Catholic Schools Inservice Day which includes staff from all Catholic Schools in the Archdioceses of Winnipeg and St. Boniface. Parents of students in Grades 9–11 are reminded of parent meetings scheduled for Thursday, 28 February at 7:00 pm. These meetings will provide an opportunity to learn about available courses for the coming school year and to discuss how the school and parents can work together in forming your sons. Please mark your calendars and plan to attend. Parking: Student Lot of Bower Blvd.